The boxes are being filled, the piano has been moved, and the truck has been ordered. We are really moving! A year later than we expected but a lot has happened in a year. God’s timing is perfect and I believe last year (my wilderness year) was a growing year. God did a lot in my heart and in my body. I was diagnosed with IBS, thankfully under control now, and had a hysterectomy earlier this year. When I look back at last year I can now see how hard it was for me. During the year, I was just trying to survive without realizing that I was in survival-mode. The kids did a lot of changing too! They grew over 2″ during the summer and again during the winter, thank you growth hormone! They are now in the 2nd and 3rd percentile! Overall, health-wise they are fairly stable, and we couldn’t ask for more than that! Our beloved doctor retired and we got a new doctor last year, which proved to be good training for changing all of our doctors soon. “What? What did you say? Tell me exactly what she said?” I asked, several times that night. To which, exasperated by the fifth time, Marseille answered, slowly, loudly, and clearly annoyed, “MR. BRANNNNDDDDOOONNNN AND MRS. FAAAIIIITTTTTHHHHH WANT TO BUUUYYYY OURRRR HOOOUUUSSE.” I burst out laughing because I was surprised at her perception. We quickly told Danny when he got home. He was equally shocked. We brushed it off for the night and decided we would wait to see if one of them would actually talk to us about it. Danny and I couldn’t let it rest. Danny called Brandon(4/10), on Wednesday (4/11) we met with them and discussed a price. The following Monday (4/16), we signed a contract. With a closing date of May 25th. Yeah. I can’t believe it. God went before us and prepared the way. Which is exactly what I believe the Lord told me last year! Leaving this area and our friends who have become family has been the hardest thing that I have every done. When I left Florida and my family, it was different. It wasn’t nearly as hard because life was just beginning. School was ending and it was a great time for a new journey. Being newly married had something to do with that as well! This time around, I have had 12 years of living life. Real life experiences: joys, prayers, losses, NICU, children, doctors, insurance, shots, money, friends, buying and selling homes. It’s hard to leave and I am glad that it is. I am glad that God rooted me here and that it is a true uprooting. My sweet friend Robyn said that I have spread seeds in this area and now I am being uprooted to spread seeds somewhere else. I couldn’t be more encouraged by that word and picture of my life. The truck will be moving all of our belongings away on Saturday. I’m still in the sad-almost excited mode. Thankfully, I am becoming more excited. I know that I will be more excited once we are actually there, with the adventure of starting again staring me in the face. In efforts to keep up with everyone, I will be posting on this blog again! We are almost done with school and are ready for a little break. This Friday is our last day of school and the kids are thrilled. I enjoy the rhythm of our days when we do school, but I am looking forward to having some personal reading and planning time. We will start school back up in the first few weeks of August. Year-round schooling has worked the best for us, our Dr. appointments and sick time are able to be worked around. Win-win. Another advantage is we don’t lose a lot of traction. We had routine echocardiograms last week and everything looked good. We have a couple appointments in the next few months. Originally, two of them were scheduled on the same day but one Dr. will be out of office so we got bumped to August. The house is still for sale. No lookers or buyers yet. It will happen when it is supposed to happen! The Bible encourages us to wait on the Lord, a lot. Like over 100 times. Waiting is so closely tied to trust and that is what we are doing. It has been a long time. Since the introduction of iPhones in my life, it has been hard to make it on the blog. We have been doing well. A lot of things are changing which is why I decided to get back on here, to keep people up to date with the goings-on. We celebrated our 11th anniversary last December. Bentley is in 3rd grade, and Marseille is in 2nd grade. The kids and I are care takers for a dear friend on Mondays and I teach yoga at the main library downtown on Friday mornings. We are enjoying our season of family life right now. It is probably the easiest it will every be! We have put our house on the market and are moving to Charlotte (as soon as the house sells). We are ready for a change in our lives. We will be closer to Danny’s family, the kids are uber excited to be by their cousins. The medical care will be easily transferred to the doctors in Charlotte, since most of our doctors are already in contact with them. We are also excited about being apart of the church there too! Yes, we did just build a house two years ago! We are sad to leave this area, but excited for the new memories we will make in Charlotte. I am soaking in every breath-taking view of the mountains right now. Leaving our close family friends will be hard too, but thankfully we will not be too far away! This move is bitter-sweet. The kids are doing well on their growth hormone. They have grown roughly 4″ since starting at the end of last summer. We are so grateful to experience this growth and the running out of shoes and clothes due to it! At their last round of blood work, our nephrologist checked their cholesterol and found it to be super high. High for an adult high. So he recommend that we change our diet. Hummm, somehow I don’t think that is the problem. His major recommendation was to cut out tea and dark soda. Thank you, Doctor but our children have had soda about 3 times their whole lives to date. Again, I am not thinking that this is the problem. Stumped, sad and feeling a little overwhelmed by all that information lead me down an old familiar path. Thankfully, God provides strength to these dry bones. He causes life to spring up from death. So, with fresh faith, I have cut out pretty much all fats, bumped up the soluble fiber, omega-3 vitamins, and lots of fruits and veggies. The kids are adjusting well, they really are such good patients and kids! Lastly, the ultrasounds showed that Bentley’s spleen was enlarged and there is concern for esophageal varices (basically a domino effect from kidneys- liver- spleen- esophagus; portal hyertension). Marseille is not far behind Bentley. Our doctors are talking about if a scope is a good action to see what is going on. In the meantime, we have added a low dosage of beta-blocker to their meds. This has proven to be a wrinkle our daily schedule because I have to record their blood pressure and 1 1/2hrs after taking the medication. Our lives have not been very schedule friendly due to getting the house on the market, so there have been some late nights in the Roberts’ home. We are getting into a timing rhythm between meds-vitamins-growth hormone- and blood pressure. I will say that this has been a stressful time. My mind “knows” it, and my body has been reacting but somehow in my mission-mode, I miss it! The kids and I have been taking walks almost everyday, and I have kept up with daily yoga. Between those two things, some essential oils, shea butter, apple cider vinegar, and bulletproof coffee. Oh yeah, lots of prayer! I have been able to laugh and cry, all at the same time with everything that is going on right now! Which is encouraging. Moving and Meds… the beat drives on. Thank you so much who ever sent this to me! I am so grateful. It arrived yesterday afternoon and I started reading it this morning! I think I tripped and fell into this year and I’m still struggling to get up. It has been the weirdest transition for me. Normally, I am all about setting up goals for the coming year and am so excited to have a fresh start. But this year, I was not ready for it. I had no time to think about anything. I woke up and it was a new year. Don’t get me wrong, I am still excited about it being a new year but frankly, I am still trying to process last year. For me last year had many highlights, but it came with a lot of health issues and some major healing. It’s was probably the hardest year of my life but the year that has given me the most freedom. The hardest times produce some major growth, right? In a nut shell, taking soy, dairy, corn and gluten out of my diet made me feel better than I ever had in my entire life. My hands didn’t swell or ache, my feet didn’t cramp, my skin cleared up and wasn’t itchy. I could actually think clearly and had energy to make it through the day. I could tolerate the sound of my children’s voices and not have crazy outburst of anger. All of these are reasons for me to stay away from my food intolerance until my body heals. I would workout and sweat a bunch and feel amazing, so I also need to find out why my body was so stressed. I couldn’t figure it out. Nothing in my life had changed and I felt like I had a good grasp on our day to day life. One of the major blessings of the year was that the kids were stable. I realized that that was “the problem”, like having stable kids should be a problem! It was like being in the eye of the storm, I was inside the calm and could see the chaos around me. In late October, one of my friends had a baby and he was in the PICU, I was actually able to visit him without feeling overwhelmed. I felt useful in the situation because I could understand what my friend was going through. Thankfully, he was healed and released quickly. But then it set in their baby was well and mine were not. Most likely they would not get better, but actually it was going to possibly get worse. It made me feel very lonely because I could relate to my friend but I had no one that could relate to me. 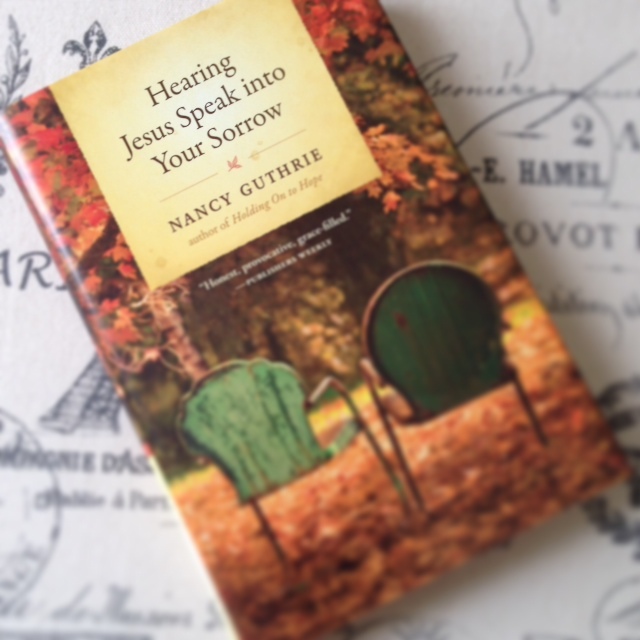 It made me wish that I had not given away my copy of Hearing Jesus Speaking into Your Sorrow. Shortly after these thoughts, by now it was November, I had a dream about Bentley not surviving his kidney transplant and what my life was like after him. I woke up very upset but didn’t know what to do with such a dream. A few days after the dream, during a book study with some of the fabulous (I sincerely mean that) women in our church, we were talking about how Jesus wept for the injustice of sin and sickness. Then it dawned on me. I had never once cried about the kids diagnosis. There was so much to do and get done that I didn’t think about processing it. I trusted God with the situation and so I felt that there was no reason to cry. Well, after 4 years of carrying all that internally my body was breaking. It couldn’t handle it anymore. Let’s just say I had to compose myself for the rest of that book study and lost it a couple days after. I cried on and off for a good week and then I felt like a brand new person. I literally felt 20 lbs lighter! I have never felt angry or questioned, anxious at times because of the waiting, but trusted that this is best for our family and that is God’s amazing grace on me. Since this healing, I have had two dreams about Bentley having his transplants. One I am laying in the hospital bed with him reading and the other I was doing yoga in the room for him (funny, huh?) But I realize that these dreams, are so kind of God. I don’t see the dream when he doesn’t survive as a nightmare but rather as God coming along side of me and saying, “We can do this, it’s going to be okay.” And I believe that it’s true because no matter the outcome God is still God. He is good and he is loving. I cherish these dreams because they have seriously caused me not to be fearful of the transplants when they come. So, with all that going on right before the bubonic plague the kids and I had at Thanksgiving, then hustle and bustle of Christmas, it is no wonder that I have not had time to focus on the new year. I am still recovering from the last one. I really have one goal for 2014 and it is to relish life. I want to enjoy every moment. I want more out of life; more fun, more memories, more living, more flossing, more crafting, more painting, more French studies, more friendships, more yoga, more reading, more love, more God. I cannot wait to see what this year has in store for us! As always, thanks for reading! !